These guys probably didn't play with blocks that fit in holes when they were kids. It's not like there was even any packaging with it. So rattling around in that box likely did it more harm than good. You don’t have to hug trees to wince at the waste in these shots. 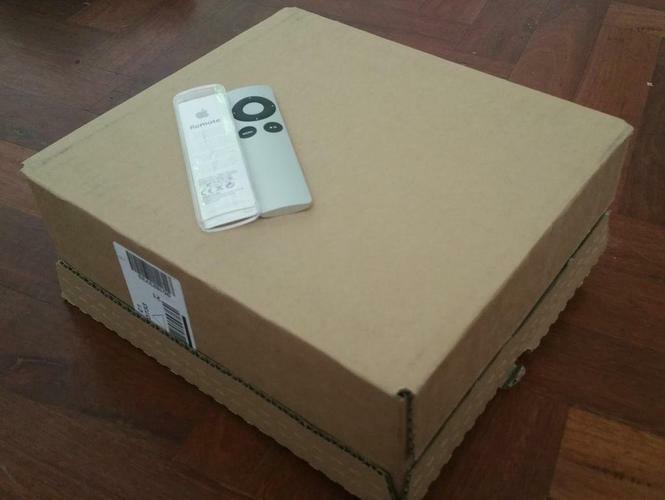 The first box was used to ship just that tiny Apple TV replacement remote. The second box literally had a letter (a single sheet of paper) and a SIM card for a phone. In both cases an envelope would have sufficed. But for Ingram Micro – one of the country’s biggest technology distributors – this unnecessary packaging is normal. Unsurprisingly, Australia doesn’t keep a national record on waste management, each State or local council may or may not collect their own data on such issues. The post-consumer packaging recycling rate between 2014 and 2015 was 61.5% with 38.7% ending up in landfill, equalling 1,830,000 tonnes or 1.83 megatonnes, according to the Australian Packaging Council. Most cardboard packaging come from trees grown for that purpose so deforestation is not impacted. Australia imports most of its cardboard. However, transporting vast amounts of cardboard is not inconsequential – whether it’s too and from ports, or at sea – there’s an environmental footprint there. Furthermore, cardboard that doesn’t get flattened out before being thrown away does not end up getting recycled. “If you’re talking about a mobile phone, there’s a whole bunch of resources that go into making the devices. Some of which are toxic like cadmium batteries, so the last thing you want is for those phone to break in the shipment stage because then all of the resources that went into making it are wasted,” he said. “The packaging is therefore vital”, which is why we see so many “hard cover” smartphone packages. But issues arise when devices are over-packaged or not properly recycled. When your recycling gets sorted, it goes through a series of processes separating cardboard from aluminium and steel via giant, industrial fans - which pick up the cardboard and paper and push it into one collection area. If the packaging isn’t light enough to be picked up by a gush of air coming through the propeller, it doesn’t get recycled. So if you don’t flatten out your iPhone packaging before throwing it into recycling, you may as well throw it into landfill. The head of campaigns for Planet Ark encouraged Australian companies to work on their labelling to educate customers on where and how their devices - and packaging - can be recycled. Grey said companies are increasingly switching to more biodegradable or recyclable materials including biodegradable beads and “mushroom foam” which is made from corn or potato starch. It looks like polystyrene but “literally just dissolves away” and can be used in compost. Ikea recently announced its intentions to replace its polystyrene with the mushroom-based eco foam or "mycelium-fungi packaging." “People are willing to go back to a company that share their ethics or that they regard as trustworthy,” she said. “If there is a reuse potential for a particular object or packaging, they could have little diagrams showing them how to reuse it, like how to make a chair out of the cardboard box you bought or how to use the packaging as garden fertiliser. Ingram Micro declined to comment on this article.